Beginning next week, we will be starting a series called Restoration Moments. These are stories taken from the lives of men who lived for Christ, and struggled to bring about the restoration of New Testament Christianity. However, these stories aren’t about the work of people leaving denominationalism behind to just be Christians. These aren’t about doctrinal struggles. These true stories are about people who lived for Christ, and how that affected their thoughts and actions. For example: next week’s Restoration Moment is about a drunken wretch, a compassionate preacher, and what happened when the congregation made it clear they didn’t want him as part of the church. A later Restoration Moment tells about the moment that a prominent preacher let go of any feelings of racism. These Restoration Moments are meant to be informative, encouraging, and helpful to you. They also happen to make really great illustrations. We are confident that you will enjoy them. One person I know used to call the local radio stations every morning and let them know which gas stations had the cheapest gas that day. He wasn’t paid to do it, nor was he ever asked to do it. Instead, he viewed it as a public service to let others know where they could save five or ten cents per gallon on their gas. If you add that up, in a normal SUV, that’s perhaps $2.50 you can save! The man did this every day. Why? Because he wanted to help others. Sure, $2.50 isn’t much, but people sure do feel like ten cents per gallon is a big deal. In fact, they’ll drive a mile or two out of their way to get their gas cheaper…never bothering to consider that they wasted a gallon of gas doing it—and thus wasted more money than they saved. Because he thought they would be interested. Saving money seems to interest most people, even if it is a little amount. I know of one person (I won’t mention his name) who uses a calculator at the grocery store to figure out how much things cost per ounce. And if it happens to save him a penny, he’ll buy the big container instead of four of the little ones—even if he’s not going to use all of it for months. Because he hoped it would be important to them. For some people who are on a very tight budget or a fixed income, every little bit helps. And hearing about the best price in town is very useful. People spread this kind of news all the time, and many times it is to total strangers. About this point, you’re either wondering where I’m going, or you’ve already figured it out. Why is it that people (including Christians) are so eager and unafraid to spread the good news about cheap gas, but are so timid and scared when it comes to spreading the REALLY good news about the gospel of Jesus Christ? Of course you do! But what is more helpful, telling people how to save $2.50, or telling them how to save their eternal soul? Do you find Jesus and the Bible and salvation interesting? There’s a lot of other people out there who do as well. What do you think is more interesting to most people? $2.50 or freedom from the guilt and consequences of their past sins? Do you think salvation is important? If you don’t try to talk to others about it, then the answer is “no.” Most people have no problem telling total strangers about good deals, all because they think saving money is important. Do you think saving souls is important? If you want to be helpful—truly helpful—to other people, tell them about Jesus. And if you want to tell them how to save $2.50 while you’re at it, then they will have two things to thank you for: helping their pocketbook, but also helping their soul. Don’t forget to read part 1, part 2, part 3, and part 4 first! The preacher laughed in teenage Victor Cross’s face when he said he wanted to be a preacher. It was over 25 years later before Victor finally overcame his sadness and bitterness towards the church. But when he came back to Jesus, Victor started working and never looked back. We saw in yesterday’s post how Victor used the power of a simple question: “Do you read your Bible every day?” to open doorways of opportunity. We saw the power of using tracts to spread the gospel throughout the world. In this, the final installment of The Life of Victor Cross, we look at the power of the postal service in evangelism. There are millions of people around the world who would love to receive letters from the United States. Victor Cross learned this as a result of his tract-spreading activities. He was contacted by someone in Nigeria who had received a tract he left on board a ship, and that led to over 100 correspondence courses completed within a year, with many of them obeying the gospel. Once, a ship was actually beginning to pull away from the harbor when Victor quickly rushed up the gangplank to ask if anyone read their Bible every day. A British man on board said “Sir, I read my Bible every day.” So, Victor handed him a tract—“The Old Paths” by Batsell Barrett Baxter. The man said, “If this is of any value, I’d like to hear from you further.” So Victor quickly wrote his name and address on the back before running back to the dock, just barely making it. Another fifteen seconds, and he would have had to swim back to the dock. It was nine days later that Victor received a letter in the mail, stating: “your ‘book’ impresses me very much. I can’t bear to part with it, but I’d like my wife to have one.” He gave her address to Victor, and that same day, copies of the tract, and four Bible courses were mailed to the British West Indies. Within a few short years, 16% of the entire island had completed the correspondence courses! Victor Cross has since gone on to his reward. But his life should be an encouragement to each of us to do what we can to spread the gospel. We don’t have to be pulpit preachers. We don’t have to be eloquent. What we have to do is make the opportunities, and use what God has given us. So, next time you go to church, pick up some tracts and hand them out. Ask people “Do you read your Bible every day?” Help get people interested in taking a Bible study course through the mail. You can even help to spread the word about Bible study courses through email, Facebook, text message, and many other forms of communication. You, too, can be an international missionary without leaving your hometown! (Note: Victor Cross and his evangelistic efforts were discussed in Firm Foundation, March 12, 1968. Much of the information in this series came from that article). To get caught up, read part 1, part 2, and part 3. Victor Cross wants to do more for Jesus. There are so many lost souls out there that need the gospel, but how can I do it? Once again, Providence intervenes. Victor took a job operating a crane, unloading cargo from ships that came into the bay near Houston, TX. This job put him in contact with seamen from all over the world. His first day on the job, he met some Germans who were bringing in a shipment, and he asked them about studying the Bible. They were very enthusiastic about it, but not being fluent in English, a study would be difficult. That very night, Victor wrote to Otis Gatewood, a preacher in Germany, asking for Bible material in German. Within a few weeks, Victor started receiving tracts and Bible study materials in German, Finnish, Spanish, Swedish, and many other languages. Victor went to work. He invited some of the sailors to his house for fried chicken (these foreign seamens had never had fried chicken before), showed them the filmstrips, and then gave them some tracts in their own language. He soon had Bibles, tracts and materials in 17 different languages. 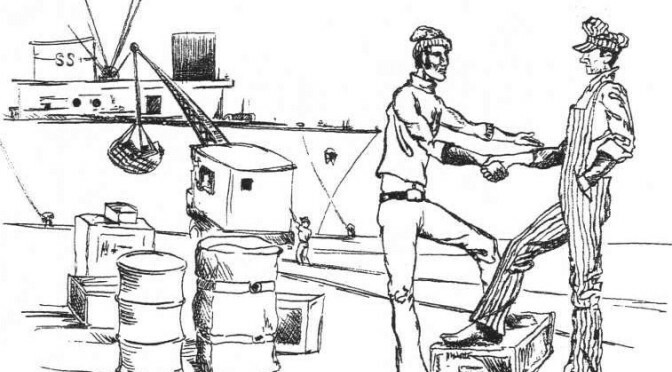 Victor met with thousands of foreign seamen each year, giving them tracts, Bibles, and encouraging them to read them. But sometimes the people aren’t so friendly. One day, he went aboard a Greek ship, and every single person refused to talk with him. So, he simply left three tracts on the ship and left. It was over a year later that the same ship came into port, and Victor again went on to see if he could talk with anyone. He entered the mess room where he saw a man reading something. It was a tract! It was one of the tracts that Victor had left over a year earlier! As Victor said “hi” and sat down, the man spoke to him. Victor never told the man that it was he who left the tract. Curious, Victor asked why. The answer was astonishing. She did, and later was baptized. Victor has done the same thing with multiple thousands of people, and the success rate is amazing. Others have followed his approach and found that it works for them too. Why? Because even people who aren’t willing to go inside a church building to save their lives are open to talking to an individual about the Bible. And though Victor Cross brought several people to Christ this way, his biggest impact for Christ—one that was felt world-wide—hadn’t even begun. Victor Cross has left the church. He has no intentions of ever going back. He’s incredibly cynical and jaded because of the way he’d been treated by some preacher. But let’s fast-forward a couple decades. And Victor came back to the Lord. Because Victor knew that he had to help be the answer to his own prayer, he began to study the Bible, and collected a modest library. He wanted to preach, but knew that he would also need to work a “regular” job to pay the bills. He bought a film projector and a set of filmstrips, and showed them to anyone who would watch. But again discouragement struck. He tried many times to get people to take a Bible correspondence course, but every time he did, the same question was asked, “what denomination?” He learned quickly that regardless of how he said it, as soon as the words “church of Christ” left his lips, the door was shut, and people’s minds became closed. Here’s a brand-new question from the question box! Let’s get straight to it! That’s a question that I’m sure lots of people have. Thanks for asking it! A disciple is someone who learns from someone else and studies under them. They follow that person’s teachings. When Jesus was on earth, He had lots of disciples. People followed Him around everywhere, wanting to learn from Him. Of course, some of the ones following Jesus were just in it for the free food. Those weren’t really disciples. Those were moochers. However, there were several people who were dedicated to studying under Jesus’ teaching. They wanted to know everything they could from this great Master Teacher. These were the disciples of Jesus. One evening, Jesus spent all night on a mountain praying. The next morning, He met with His disciples. From among those many disciples, Jesus chose twelve men to be His primary messengers (Luke 6:12-13). These men were named Peter, Andrew, James (the son of Zebedee), John, Philip, Thomas, Matthew, Bartholemew, James (the son of Alphaeus), Simon, Thaddeaus, and Judas. These are the men who Jesus called the apostles. So, a disciple is a follower, or a learner of someone else (John the baptizer had disciples, too—John 3:25). The apostles were a special selected group of Jesus’ disciples. All of the apostles were disciples of Jesus. But not all of the disciples of Jesus got to be apostles. But what is an apostle? The word apostle means “one who is sent out on a mission.” Jesus was called an apostle because He was sent by God with a mission (Hebrews 3:1). Paul and Barnabas were called apostles because they were sent by the church in Antioch (Acts 14:14, see also Acts 13:1-3). The twelve men that Jesus selected to be apostles were men who He was sending out on a mission. That mission was to spread the gospel to the whole world, starting in Jerusalem (Mark 16:15-16, Luke 24:47). All of Jesus’ apostles were given special abilities—miracles—so that they could prove that what they were saying was true (Mark 16:20, Acts 1:26-2:4). An apostle of Jesus Christ was a special disciple, selected by Jesus and sent on a special mission. Today, we can be disciples of Jesus Christ, learning from Him through His word, but no one today can be an apostle. To submit your own question, contact us. We are excited about next week! Who is Victor Cross? You’ll just have to wait and see. Not even Google can help you on this one (trust me, I checked). It is a true story of the influence one man can have for Christ. Because we will be presenting this special series, there will be no Bible Q&A on Friday, May 2nd. That Friday feature will resume on the 9th.